We got news just before tip off that Collin Sexton would be out with an abdominal injury. I have not heard any more specifics, and supposedly he is "day to day." Aren't we all? In any event, I'm not sure how much we can trust any official information from the team on injury reports. Donta Hall was supposed to be out at least 10 days, but he came off the bench and played a big part in the win. Sometimes losing a key player can bring a team together short term, as everyone ups their game to pick up the slack. I think we've seen a bit of this in the last 2 games, but long term, we are going to need to get everyone back and healthy. I'm afraid this seemingly never-ending plague of injuries will catch up to us at some point. Coach Johnson utilized a starting lineup of Dazon, JP, Herb, Key, and Dan. This unit was able to take advantage of some early auburn mistakes and jump out to a 9 point lead. Unfortunately, Dazon looked a bit rusty at the point guard position, especially in the first half. There was little flow to the offense and we ended up with 12 turnovers in the first half. The tigers were able to come back and re-take the lead, but fortunately our guys made enough plays to keep it close. Alex made a couple of big 3's late to tie it, but auburn answered with a buzzer beater to lead 33-30 going into the half. Alabama extended the defense in the second half, and Herb was able to mostly shut down Bryce Brown. After shooting 46% from the 3 point line in the first half, we held auburn to only 2 of 11 in the second half, and one of those was a miracle, contested desperation shot that hit the front of the rim and bounced about 6 feet straight up before dropping in. Meanwhile, JP was absolutely on fire. He showed the world why he was heavily recruited by the likes of Coach Cal and Kentucky. He ended up with 27 points on 8 of 13 from 3 point range. This opened up things for Dazon to drive to the basket, and he contributed with 16 points, making 10 of 13 from the free throw line. Herb also had one of his better games offensively. He scored 11 points, and was able to take advantage of a mis-match by posting up auburn's smaller guards. He even ran point for much of the second half and did a great job. Just an awesome all-around performance from Herb. Given the size advantage, I was hoping for a better game out of Dan, especially with Donta banged up. I'm afraid he may be the Anna Kournikova of college basketball centers, in that he looks great but doesn't play very well. Dude looks like a bigger Lebron, but seems a second or two slow in reacting to everything. He only played 13 minutes due to foul trouble, and he probably could have been called for an additional moving screen or two. It seems he's good for at least two of those per game. Despite all of that, his one basket may have been the best of the game. 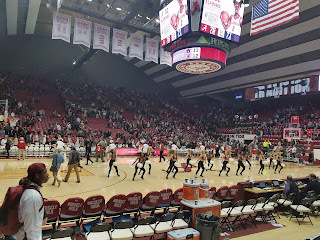 It was a thunderous dunk over a couple of aubies that got the crowd into the game and ignited the run to help us build a 13 point lead. We knew rebounding would be key in this one, as auburn is surprisingly good on the glass despite being undersized. We won the battle of the boards 37-35, and although Key and Alex gave up some big offensive rebounds late, I thought we did a nice job of boxing out and getting to the ball for the most part. Key ended up with 9 rebounds, Herb had 7, and Donta pulled down 5 with his one arm in only 15 minutes of playing time. I was a little surprised we didn't use Donta more late in the game on defense to protect the rim. A physical, rivalry game is always a difficult game to officiate, especially one with so many block/charge train-wrecks. I thought they were inconsistent on the block/charge calls, and they seemed to go disproportionately against us. Herb's 5th foul was terrible, from my vantage point it looked like he didn't even touch the guy. The ending of the game did not go quite as smoothly as we would have liked. With a comfortable lead, the last thing you want to do is put them on the line with a chance to gain ground with the clock stopped. At one point, auburn shot 8 free throws in 3 possessions, but thankfully only made 2 of them. The "ball don't lie," as they say. Nevertheless, they made just enough free throws and we missed just enough down the stretch to let them back within 3 for their final possession. I would have preferred to foul around half court and put them on the line with 2 seconds or so left in that situation, but it didn't matter as they stepped on the line anyway, ending their attempt at a comeback. Overall, I thought this was one of Coach Johnson's best coaching jobs. He coached circles around Bruce Pearl, creating and exploiting matchups with his substitutions, and making great halftime adjustments like extending the defense and moving Herb to point. We had a great gameplan of controlling the tempo, and the guys executed by choosing wisely when to run in transition, but mostly operating in the half-court and getting back on defense to force auburn to work for their shots. With a full roster, I think we could run with them, but without Donta and Collin, we were wise to slow it down and try to negate their quickness. We also ran a lot more set plays with screens for Petty in the second half, and got Herb involved in a 2-man game. The only decisions I didn't agree with were not fouling at the end, and playing Alex over Donta defensively late in the game, but I understand the reasoning for both. The rotation was much better given the roster limitations, but there was one lineup in the first half of AJ, Herb, Key, Galin, and Alex that didn't make much sense to me. The near sellout crowd was great. I would guess there were close to 14,000 for the early start on a very cold Wednesday night. Despite Pearl's rhetoric about fans travelling and all the marketing auburn did for this game, their fans made up about 5% of the crowd as far as I could tell. There was one annoying barner sitting on the last row of the floor seats in front of us who refused to sit down for most of the game. There was a sense of impending doom with Sexton's absence in the first half, but the crowd was loud and standing for most of the second during and after the big run. I think the noise affected auburn's offense a bit. 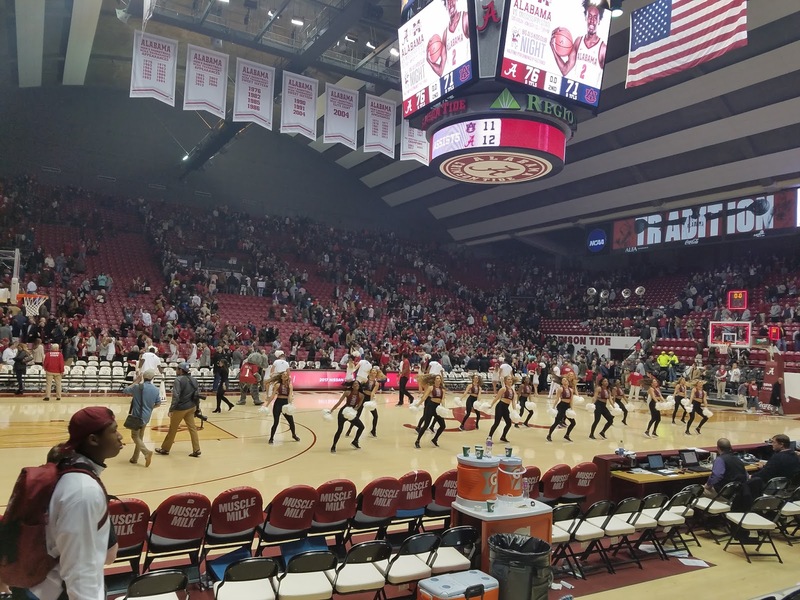 My only complaint was that the band did not play Rammer Jammer after the game, but at least we did get to chant "O-ver-ra-ted" and "FBI!" at them. The team walked over to the student section and exchanged high-fives after the victory. Up next, rivalry week continues as the mississippi $tate bulldogs come to Tuscaloosa for a 7:30 pm start Saturday night. A lot of people will be in town for the football national championship celebration, so hopefully they will stick around and pack the house. The game will be televised on the SEC Network.